May 27, 1999: An impact basin deep enough to swallow Mount Everest and surprising slopes in Valles Marineris highlight a global map of Mars that will influence scientific understanding of the red planet for years. Right: A false-color animation of Mars showing four hemispheric views at 90 degree intervals. 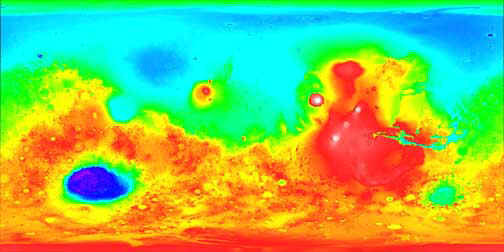 Colors correspond to elevations measured by the Mars Orbiter Laser Altimeter on the Mars Global Surveyor spacecraft. Red and white colors denote high elevations; blue denotes low. Generated by the Mars Orbiter Laser Altimeter (MOLA), an instrument aboard NASA's Mars Global Surveyor, the high-resolution map represents 27 million elevation measurements gathered in 1998 and 1999. The data were assembled into a global grid with each point spaced 37 miles (60 kilometers) apart at the equator, and less elsewhere. Each elevation point is known with an accuracy of 42 feet (13 meters) in general, with large areas of the flat northern hemisphere known to better than six feet (two meters). "This incredible database means that we now know the topography of Mars better than many continental regions on Earth," said Dr. Carl Pilcher, Science Director for Solar System Exploration at NASA Headquarters, Washington, DC. "The data will serve as a basic reference book for Mars scientists for many years, and should inspire a variety of new insights about the planet's geologic history and the ways that water has flowed across its surface during the past four billion years." "The full range of topography on Mars is about 19 miles (30 kilometers), one and a half times the range of elevations found on Earth," noted Dr. David Smith of NASA's Goddard Space Flight Center, Greenbelt, MD, the principal investigator for MOLA and lead author of a study to be published in the May 28, 1999, issue of Science. "The most curious aspect of the topographic map is the striking difference between the planet’s low, smooth Northern Hemisphere and the heavily cratered Southern Hemisphere," which sits, on average, about three miles (five kilometers) higher than the north, Smith added. The MOLA data show that the Northern Hemisphere depression is distinctly not circular, and suggest that it was shaped by internal geologic processes during the earliest stages of martian evolution. The massive Hellas impact basin in the Southern Hemisphere is another striking feature of the map. Nearly six miles (nine kilometers) deep and 1,300 miles (2,100 kilometers) across, the basin is surrounded by a ring of material that rises 1.25 miles (about two kilometers) above the surroundings and stretches out to 2,500 miles (4,000 kilometers) from the basin center. This ring of material, likely thrown out of the basin during the impact of an asteroid, has a volume equivalent to a two-mile (3.5-kilometer) thick layer spread over the continental United States, and it contributes significantly to the high topography in the Southern Hemisphere. The difference in elevation between the hemispheres results in a slope from the South Pole to North Pole that was the major influence on the global-scale flow of water early in martian history. Scientific models of watersheds using the new elevation map show that the Northern Hemisphere lowlands would have drained three-quarters of the martian surface. On a more regional scale, the new data show that the eastern part of the vast Valles Marineris canyon slopes away from nearby outflow channels, with part of it lying a half-mile (about one kilometer) below the level of the outflow channels. "While water flowed south to north in general, the data clearly reveal the localized areas where water may have once formed ponds, " explained Dr. Maria Zuber of the Massachusetts Institute of Technology, Cambridge, MA, and Goddard. 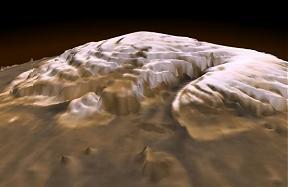 Right: This dramatic three-dimensional visualization of Mars' north pole is based on elevation measurements made by an orbiting laser. During the Spring and Summer of 1998 the Mars Orbiter Laser Altimeter (MOLA) flashed laser pulses toward the Martian surface from the Global Surveyor spacecraft and recorded the time it took to detect the reflection. This timing data has now been translated to a detailed topographic map of Mars' north polar terrain. More information. The amount of water on Mars can be estimated using the new data about the south polar cap and information about the North Pole released last year. While the poles appear very different from each other visually, they show a striking similarity in elevation profiles. Based on recent understanding of the North Pole, this suggests that the South Pole has a significant water ice component, in addition to carbon dioxide ice. The upper limit on the present amount of water on the martian surface is 800,000 to 1.2 million cubic miles (3.2 to 4.7 million cubic kilometers), or about 1.5 times the amount of ice covering Greenland. If both caps are composed completely of water, the combined volumes are equivalent to a global layer 66 to 100 feet (22 to 33 meters) deep, about one-third the minimum volume of a proposed ancient ocean on Mars. During the ongoing Mars Global Surveyor mission, the MOLA instrument is collecting about 900,000 measurements of elevation every day. These data will further improve the global model, help engineers assess the area where NASA's Mars Polar Lander mission will set down on Dec. 3, and aid the selection of future landing sites. MOLA was designed and built by the Laser Remote Sensing Branch of the Laboratory for Terrestrial Physics at Goddard. The Mars Global Surveyor mission is managed for NASA's Office of Space Science, Washington, DC, by the Jet Propulsion Laboratory, Pasadena, CA, a division of the California Institute of Technology.